Data analysis is only half the battle; getting the data into a Hadoop cluster is the first step in any Big Data deployment. Apache Flume uses an elegant design to make data loading easy and efficient. No technology is more synonymous with Big Data than Apache Hadoop. Hadoop’s distributed filesystem and compute framework make possible cost-effective, linearly scalable processing of petabytes of data. Unfortunately, there are few tutorials devoted to how to get big data into Hadoop in the first place. Some data destined for Hadoop clusters surely comes from sporadic bulk loading processes, such as database and mainframe offloads and batched data dumps from legacy systems. But what has made data really big in recent years is that most new data is contained in high-throughput streams. Application logs, GPS tracking, social media updates, and digital sensors all constitute fast-moving streams begging for storage in the Hadoop Distributed File System (HDFS). As you might expect, several technologies have been developed to address the need for collection and transport of these high-throughput streams. Facebook’s Scribe and Apache/LinkedIn’s Kafka both offer solutions to the problem, but Apache Flume is rapidly becoming a de facto standard for directing data streams into Hadoop. This article describes the basics of Apache Flume and illustrates how to quickly set up Flume agents for collecting fast-moving data streams and pushing the data into Hadoop’s filesystem. By the time we’re finished, you should be able to configure and launch a Flume agent and understand how multi-hop and fan-out flows are easily constructed from multiple agents. Figure 1: Flume Agents consist of sources, channels, and sinks. Put simply, Flume sources listen for and consume events. Events can range from newline-terminated strings in stdout to HTTP POSTs and RPC calls — it all depends on what sources the agent is configured to use. Flume agents may have more than one source, but must have at least one. Sources require a name and a type; the type then dictates additional configuration parameters. On consuming an event, Flume sources write the event to a channel. Importantly, sources write to their channels as transactions. By dealing in events and transactions, Flume agents maintain end-to-end flow reliability. Events are not dropped inside a Flume agent unless the channel is explicitly allowed to discard them due to a full queue. Channels are the mechanism by which Flume agents transfer events from their sources to their sinks. Events written to the channel by a source are not removed from the channel until a sink removes that event in a transaction. This allows Flume sinks to retry writes in the event of a failure in the external repository (such as HDFS or an outgoing network connection). For example, if the network between a Flume agent and a Hadoop cluster goes down, the channel will keep all events queued until the sink can correctly write to the cluster and close its transactions with the channel. Channels are typically of two types: in-memory queues and durable disk-backed queues. In-memory channels provide high throughput but no recovery if an agent fails. File or database-backed channels, on the other hand, are durable. They support full recovery and event replay in the case of agent failure. Sinks provide Flume agents pluggable output capability — if you need to write to a new type storage, just write a Java class that implements the necessary classes. Like sources, sinks correspond to a type of output: writes to HDFS or HBase, remote procedure calls to other agents, or any number of other external repositories. Sinks remove events from the channel in transactions and write them to output. Transactions close when the event is successfully written, ensuring that all events are committed to their final destination. A simple one-source, one-sink Flume agent can be configured with just a single configuration file. In this example, I’ll create a text file named sample_agent.conf — it looks a lot like a Java properties file. At the top of the file, I configure the agent’s name and the names of its source, sink, and channel. This defines an agent named hdfs-agent and the names of the sources, sinks, and channels; keep the name in mind, because we’ll need it to start the agent. Multiple sources, sinks, and channels can be defined on these lines as a whitespace-delimited list of names. In this case, the source is named netcat-collect, the sink hdfs-write, and the channel is named memory-channel. The names are indicative of what I’m setting up: events collected via netcat will be written to HDFS and I will use a memory-only queue for transactions. Next, I configure the source. I use a netcat source, as it provides a simple means of interactively testing the agent. A netcat source requires a type as well as an address and port to which it should bind. The netcat source will listen on localhost on port 11111; messages to netcat will be consumed by the source as events. With the source defined, I’ll configure the sink to write to HDFS. HDFS sinks support a number of options, but by default, the HDFS sink writes Hadoop SequenceFiles. In this example, I’ll specify the sink write raw textfiles to HDFS so they can be easily inspected; I’ll also set a roll interval, which forces Flume to commit writes to HDFS every 30 seconds. File rolls can be configured based on time, size, or a combination of the two. The file rolls are particularly important in environments for which HDFS does not support appending to files. Finally, I’ll configure a memory-backed channel to transfer events from source to sink and connect them together. Keep in mind that if I exceed the channel capacity, Flume will drop events. If I need durability in a file or JDBC, channel should be used instead. In a separate terminal, connect to the agent via netcat and enter a series of messages. In the agent logs, an HDFS file will be created and committed every 30 seconds. If I print the contents of the files to standard out using HDFS cat, I’ll find the messages from netcat are stored. Regardless of source, direct writers to HDFS are too simple to be suitable for many deployments: Application servers may reside in the cloud while clusters are on-premise, many streams of data may need to be consolidated, or events may need to be filtered during transmission. Fortunately, Flume easily enables reliable multi-hop event transmission. Fan-in and fan-out patterns are readily supported via multiple sources and channel options. Additionally, Flume provides the notion of interceptors, which allow the decoration and filtering of events in flight. Flume provides multi-hop deployments via Apache Avro-serialized RPC calls. For a given hop, the sending agent implements an Avro sink directed to a host and port where the receiving agent is listening. The receiver implements an Avro source bound to the designated host-port combination. Reliability is ensured by Flume’s transaction model. The sink on the sending agent does not close its transaction until receipt is acknowledged by the receiver. Similarly, the receiver does not acknowledge receipt until the incoming event has been committed to its channel. Figure 2: Multihop event flows are constructed using RPCs between Avro sources and sinks. Fan-in is a common case for Flume agents. Agents may be run on many data collectors (such as application servers) in a large deployment, while only one or two writers to a remote Hadoop cluster are required to handle the total event throughput. In this case, the Flume topology is simple to configure. Each agent at a data collector implements the appropriate source and an Avro sink. All Avro sinks point to the host and port of the Flume agent charged with writing to the Hadoop cluster. The agent at the Hadoop cluster simply configures an Avro source on the designated host and port. Incoming events are consolidated automatically and are written to the configured sink. Fan-out topologies are enabled via Flume’s source selectors. Selectors can be replicating — sending all events to multiple channels — or multiplexing. Multiplexed sources can be partitioned by mappings defined on events via interceptors. For example, a replicating selector may be appropriate when events need to be sent to HDFS and to flat log files or a database. Multiplexed selectors are useful when different mappings should be directed to different writers; for example, data destined for partitioned Hive tables may be best handled via multiplexing. Flume provides a robust system of interceptors for in-flight modification of events. Some interceptors serve to decorate data with metadata useful in multiplexing the data or processing it after it has been written to the sink. Common decorations include timestamps, hostnames, and static headers. It’s a great way to keep track of when your data arrived and from where it came. More interestingly, interceptors can be used to selectively filter or decorate events. The Regex Filtering Interceptor allows events to be dropped if they match the provided regular expression. Similarly, the Regex Extractor Interceptor decorates event headers according to a regular expression. This is useful if incoming events require multiplexing, but static definitions are too inflexible. There are lots of ways to acquire Big Data with which to fill up a Hadoop cluster, but many of those data sources arrive as fast-moving streams of data. Fortunately, the Hadoop ecosystem contains a component specifically designed for transporting and writing these streams: Apache Flume. Flume provides a robust, self-contained application which ensures reliable transportation of streaming data. Flume agents are easy to configure, requiring only a property file and an agent name. Moreover, Flume’s simple source-channel-sink design allows us to build complicated flows using only a set of Flume agents. So, while we don’t often address the process of acquiring Big Data for our Hadoop clusters, doing so is as easy and fun as taking a log ride. Hadoop Architecture is similar to the master-slave architecture. The master node is called the namenode and the slave nodes are called datanodes. The datanodes are also called as worker nodes. The namenode is the heart of the hadoop system and it manages the filesystem namespace. The namenode stores the directory, files and file to block mapping metadata on the local disk. The namenode stores this metadata in two files, the namespace image and the edit log. When you installed the hadoop, the image and edit log files will be empty. As soon as the clients starts writing the data, the namenode writes the file related metadata to the edit log and constructs the file to block and block to datanode mapping in the memory. The namenode does not write the block to data node mapping persistently on the local disk. It just maintains this mapping in the memory. When you restart the namenode, then the namenode goes into a safemode. In this safemode, the namenode merges all the edit log files and writes the metadata into the image file. The namenode then clears the edit log files and waits for the datanodes to reports the blocks. As soon as the datanodes starts reporting the blocks, the namenode constructs the block to datanode mapping in the memory. Once the datanodes completes reporting or cross a certain threshold, the namenode comes out of the safe mode. In safe mode the client cannot do any operations. As the namenode writes the metadata into the memory, the number of files that you can store in hadoop is controlled by the namenode memory size. As a thumb rule, if the metadata of file takes 150 bytes, then to store one million files you need at least 300MB of ram on the namenode. Without the namenode, you cannot access the hadoop system. If the namenode goes down then the complete hadoop system is inaccessible. So it is always better to take backup of the image and edit log files. Hadoop provides two ways for taking backup of the image and edit log files. One way is to use the secondary namenode and the second way is to write the files to a remote system. The secondary Namenode job is to periodically merge the image file with edit log file. This merge operation is to avoid the edit log file from growing into a large file. The secondary namenode runs on a separate machine and copies the image and edit log files periodically. The secondary namenode requires as much memory as the primary namenode. If the namenode crashes, then you can use the copied image and edit log files from secondary namenode and bring the primary namenode up. However, the state of secondary namenode lags from the primary namenode. So in case of namenode failure, the data loss is obvious. Note: You cannot make the secondary namenode as the primary namenode. You can configure the namenode to write the image and edit log files to multiple remote network file systems. These write operations are synchronous and atomic. The namenode first writes the metadata to the edit log on the local disk, then writes to the remote NFS system and then to the memory. Once all these operations are success, then the namenode commits the state. In case of any failure, you can copy the files from the remote NFS system and start the namenode. In this case, there is no loss of data. Hadoop is an apache open source software (java framework) which runs on a cluster of commodity machines. Hadoop provides both distributed storage and distributed processing of very large data sets. Hadoop is capable of processing big data of sizes ranging from Gigabytes to Petabytes. Hadoop is a master/ slave architecture. The master being the namenode and slaves are datanodes. The namenode controls the access to the data by clients. The datanodes manage the storage of data on the nodes that are running on. Hadoop splits the file into one or more blocks and these blocks are stored in the datanodes. Each data block is replicated to 3 different datanodes to provide high availability of the hadoop system. The block replication factor is configurable. Hadoop Distributed File System: HDFS is designed to run on commodity machines which are of low cost hardware. The distributed data is stored in the HDFS file system. HDFS is highly fault tolerant and provides high throughput access to the applications that require big data. Namenode: Namenode is the heart of the hadoop system. The namenode manages the file system namespace. It stores the metadata information of the data blocks. This metadata is stored permanently on to local disk in the form of namespace image and edit log file. The namenode also knows the location of the data blocks on the data node. However the namenode does not store this information persistently. The namenode creates the block to datanode mapping when it is restarted. If the namenode crashes, then the entire hadoop system goes down. 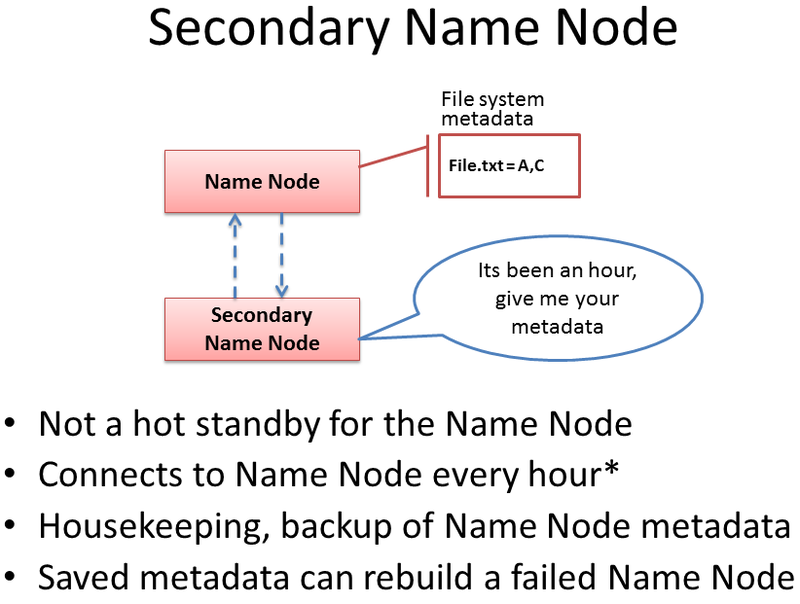 Secondary Namenode: The responsibility of secondary name node is to periodically copy and merge the namespace image and edit log. In case if the name node crashes, then the namespace image stored in secondary namenode can be used to restart the namenode. DataNode: It stores the blocks of data and retrieves them. The datanodes also reports the blocks information to the namenode periodically. JobTracker: JobTracker responsibility is to schedule the clients jobs. Job tracker creates map and reduce tasks and schedules them to run on the datanodes (tasktrackers). Job Tracker also checks for any failed tasks and reschedules the failed tasks on another datanode. Jobtracker can be run on the namenode or a separate node. TaskTracker: Tasktracker runs on the datanodes. Task trackers responsibility is to run the the map or reduce tasks assigned by the namenode and to report the status of the tasks to the namenode. Hadoop file system (fs) shell commands are used to perform various file operations like copying file, changing permissions, viewing the contents of the file, changing ownership of files, creating directories etc. All the fs shell commands takes the path URI as arguments. The format of URI is sheme://authority/path. The scheme and authority are optional. For hadoop the scheme is hdfs and for local file system the scheme is file. IF you do not specify a scheme, the default scheme is taken from the configuration file. You can also specify the directories in hdfs along with the URI as hdfs://namenodehost/dir1/dir2 or simple /dir1/dir2. The above command lists out the files in the employees directory. The output of hadoop fs ls command is almost similar to the unix ls command. The only difference is in the second field. For a file, the second field indicates the number of replicas and for a directory, the second field is empty. The hadoop fs lsr command is similar to the ls -R command in unix. The above command creates the hadoopdemo directory in the /user/hadoop directory. The above command creates the dir1/dir2/demo directory in /user/hadoop directory. View the contents of the hdfs file. The -ignorecrc option is used to copy the files that fail the crc check. The -crc option is for copying the files along with their CRC. The addnl option is for adding new line character at the end of each file. Hadoop setrep is used to change the replication factor of a file. Use the -R option for recursively changing the replication factor. Hadoop tail command prints the last kilobytes of the file. The -f option can be used same as in unix. Here “e” for checking the existence of a file, “z” for checking the file is zero length or not, “d” for checking the path is a directory or no. On success, the test command returns 1 else 0.